Hardee County 4-H youth members were busy in the month of July. 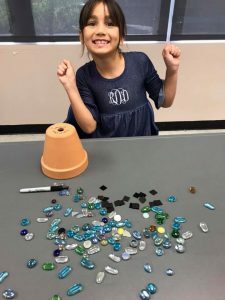 We had two exciting and busy summer camps planned this year. For the first week, camp was located at the Extension Office and the youth members participated in arts & crafts. The following week, we went on agriculture and eco tours in Hardee and Highlands County. 4-H Arts & Crafts Camp was held July 9-12th and youth members enjoyed all things arts and crafts. 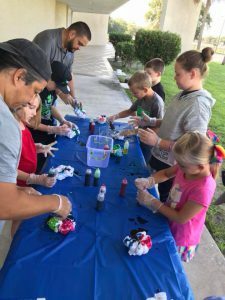 Activities included tie-dye shirts, painted pots for planting, photo keychains, basket weaving, making mobiles and paintball art. The 4-H members also participated in physical activities outside such as playing soccer; fishing and they even completed a service project of “taking care of nature” as they picked up garbage around the lake. production and the effect on the environment. They also learned about the importance of reclaiming the land to preserve it for future generations. After lunch, the 4-H youth went on a canoe trip around the lake to enjoy nature. On Wednesday morning, we traveled to Nickerson Dairy to meet up with Brittany Nickerson and Courtney Campbell to learn about dairy cows and the milk industry. Youth members enjoyed an ice cream treat before heading off to lunch (who wouldn’t?) After lunch, members were able to learn about poultry production and learned how to make their own incubators out of foam coolers! Finally, on Thursday, youth members enjoyed learning about beehives at the Hardee County Extension Office. They were able to see and interact safely with the beneficial insects. As always, we want to thank all of our volunteers that not only help us with chaperoning the youth, but the businesses as well that are always willing to host us and show the youth members the importance and impact that agriculture has on our economy.